Winters' Day In: The Quest for the Perfect Glove, uh, Mitten, uh.... GLITTEN!! The Quest for the Perfect Glove, uh, Mitten, uh.... GLITTEN!! Jude has been asking me to make him a new pair of mittens for a while. The lined ones I made him a couple of years ago have worn out beyond repair (and trust me, they were repaired multiple times before reaching that point), and he is now saying that the shearling leather ones we got him last year are becoming less effective because the fleece is wearing out of the inside. Given that he gets them soaking wet fairly often, the leather has seen better days, too. So, having finally finished yet another pair of socks that I had had on the needles for the last month, I brought it up with Jude on the weekend. "Are new mittens still a high priority for you?" Yes, they were, he affirmed. "But could you make something more like a glove? I want to be able to do more stuff with them." Ah, the perpetual winter problem: how to have the warmth of a mitten with the dexterity of a glove. The traditional solution, a fingerless flip-top glove, has its own problems: when it is -40 outside, you don't want your fingers completely exposed for even the few seconds it takes to dig your keys (or, in Jude's case, something like a book or whatever) out of the snow. Another consideration when knitting handwear is that they need to be lined to be effective the majority of the time in our sub-freezing temperatures. Watch for the pattern to be in my store soon! So, please post a picture of the glove with the flip top fingers. Sounds interesting. Will do, once I get that far. The fingers will not flip. 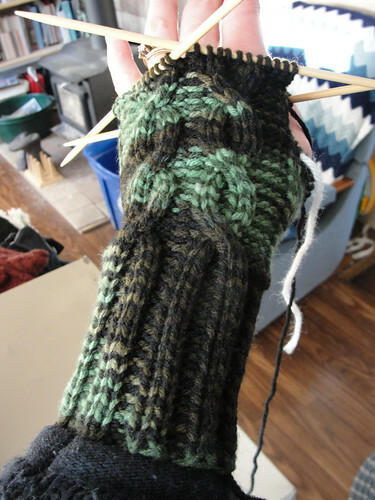 There will be regular fingers, with a flip-top mitten cover over them.